On November 9 and 10, 1938, Nazi leadership unleashed an unprecedented orchestrated wave of violence against Jews in Germany, Austria, and the Sudetenland, supposedly in response to the assassination of a Nazi diplomat by a young Polish Jew, but in reality to force the remaining Jews out of the country. During the pogrom, Stormtroopers, Hitler Youth, and ordinary Germans murdered more than a hundred Jews (many more committed suicide) and ransacked and destroyed thousands of Jewish institutions, synagogues, shops, and homes. Thirty thousand Jews were arrested and sent to Nazi concentration camps. 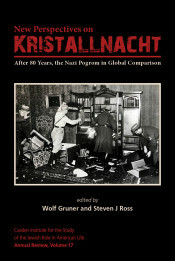 Volume 17 of the Casden Annual Review includes a series of articles presented at an international conference titled “New Perspectives on Kristallnacht: After 80 Years, the Nazi Pogrom in Global Comparison.” Assessing events 80 years after the violent anti-Jewish pogrom of 1938, contributors to this volume offer new cutting-edge scholarship on the event and its repercussions. Contributors include scholars from the United States, Germany, Israel, and the United Kingdom who represent a wide variety of disciplines, including history, political science, and Jewish and media studies. Their essays discuss reactions to the pogrom by victims and witnesses inside Nazi Germany as well as by foreign journalists, diplomats, Jewish organizations, and Jewish print media. 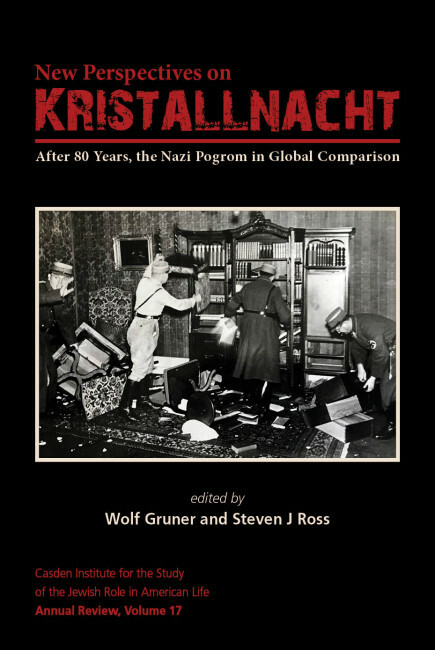 Several contributors to the volume analyze postwar narratives of and global comparisons to Kristallnacht, with the aim of situating this anti-Jewish pogrom in its historical context, as well as its place in world history. Wolf Gruner is the Shapell-Guerin Chair in Jewish Studies and a professor of history at USC. He is a specialist for Holocaust and German-Jewish history, topics on which he has published eleven books and around 60 articles and book chapters. Currently, he is conducting research on forgotten acts of individual resistance of German and Austrian Jews during the Holocaust. Additional areas of research include the comparative history of mass violence as well as state discrimination against indigenous populations, especially in Latin America. In 2014, he became the founding director of the USC Shoah Foundation Center for Advanced Genocide Research. His latest book on the Holocaust in Bohemia and Moravia received the Sybil Halpern Milton Memorial Book Prize of the German Studies Association 2017 for the best book in Holocaust Studies in 2015–2016 and was a finalist for the Yad Vashem International Book Prize in Holocaust Research for the best book in 2015 and 2016. Steven J. Ross is a professor of history at USC. Ross received his BA from Columbia University, a bachelor of philosophy from Oxford University, and a PhD from Princeton University. Ross has written extensively in the areas of working-class history, social history, film history, and political history. Ross’s most recent book, Hitler in Los Angeles: How Jews Foiled Nazi Plots Against Hollywood and America (Bloomsbury Press), was named a finalist for the Pulitzer Prize in History for 2018 and has been featured on the Los Angeles Times best-seller list. Ross directs the Casden Institute for the Study of the Jewish Role in American Life. He is also the cofounder and former codirector of the Los Angeles Institute for the Humanities at USC.